Available online only at nationals.com/Post, while supplies last. Certain restrictions apply, see website for details. Special ticket events are not eligible for this offer. Visitors watch two white whales form a heart shape Monday as they work with trainers during a show at Haichang Ocean Park in Shanghai. Others cover stories. We uncover them. 1-800-304-6765, Ext. 4 sub.wpsubscribe.com/spring19e Offer expires 5/31/19. Available to new subscribers only. Restrictions may apply. New subscriptions are subject to a $4.95 activation fee. The Downtown Day Services Center provides a space for people experiencing homelessness to shower, use computers and do laundry. Improvement District. The center opened in late February in the basement of the New York Avenue Presbyterian Church, near Metro Center. “When each person comes out, they wipe down the shower and mop down the floor,” El said, after a worker entered the shower with a bottle of cleanser. El recalled that wasn’t even the case in gyms he’d used in better times. “I don’t want to just say we’re being treated humanely,” he said. “It exceeds the humane level.” In a common room near the shower room, dozens of men and women sat at tables with soft R&B playing in the background. Five employees at the Capital Gazette were killed in an attack last June. Carlos Lozada of The Washington Post was named the winner of the Pulitzer Prize for criticism. Search on for suspect charged in death of 3-month-old in SE D.C. Contact us for details and admissions requirements. The George Washington University is an equal opportunity/ afÅµrmative action institution certiÅµed to operate in Va by SCHEV. Stand right, walk left? Maybe not. everyone standing on the escalator is lazy and slow, and they would rather everybody walk.” And it turns out that although Washington’s Metro officially adheres to pass-left, stand-right etiquette, there’s ambivalence. From the website: “Stand to the right facing forward. Walk on the left.” But Metro officials at times have played down the official line or flatly contradicted it. Still, thanks to the riders themselves, the “stand right” etiquette is pretty well established in D.C. — to the extent that reminders and other signage are unnecessary, a spokesman said. “Metro customers have done more to determine escalator etiquette than any policy, rule, or sign ever could,” Metro spokesman Ian Jannetta said in an email. “There are places, such as the website, where we note customary behavior with the goal of familiarizing new riders and visitors. … [But] it’s also important to note that, while we recognize the common practice of ‘standing to the right,’ we don’t officially encourage walking on a moving escalator.” Sounds like that’s our job. METRO The surveillance camera is perfectly placed to show the man walking along a nearly empty Metro platform. He steps sure-footedly across the distinctive hexagonal flooring, moving into place as any waiting passenger would do. It’s easy to miss the white cane he sweeps and taps in front of him with confidence. The man arrives at the bumpy strip of tile meant exactly for this moment: to warn the visually impaired that they are at the brink. He stops, tests his path carefully, seemingly aware of the void inches away. And then, for unclear reasons, he takes a further step and tumbles down onto the tracks. “It’s a very hard video to watch,” said the man’s sister, Syl Higgins, a local fitness instructor. “You hear about things like this all the time, but when it’s your own brother …” Higgins didn’t identify her brother, saying he was too embarrassed to talk about his chilling misstep last Tuesday at Bethesda’s Medical Center station on the Red Line. Luckily, bystanders quickly ran over and pulled the man to safety seconds before a train pulled into the station. “I am so thankful to those people,” Higgins said. Metro officials said the man was taken to a hospital for injuries that were not lifethreatening and released. The moving of fuel units began Monday at the Fukushima nuclear plant. VÂłDQGKRZLWVKDSHG WKHEOLQGZRUVKLSRI DIĂ XHQFHWRGD\ %\0LFKDHO6RNRORYH turns deeply religious. His play â&#x20AC;&#x153;Disgraced,â&#x20AC;? an emotionally raw drama focused on a culturally conďŹ&#x201A;icted Pakistani-American lawyer, was awarded the 2013 Pulitzer Prize for drama. Mr. Akhtarâ&#x20AC;&#x2122;s subject has been the tension between the sacred and the secular â&#x20AC;&#x201D; how to honor oneâ&#x20AC;&#x2122;s culture, including its ancient religion, without being imprisoned by it. â&#x20AC;&#x153;â&#x20AC;Ś[H]is new play, â&#x20AC;&#x153;Junk,â&#x20AC;? marks yet another creative turn. The setting is Wall Street in the 1980s and the battle between an entitled old-money establishment and a new wave of aggressive corporate raiders. Like his other work, â&#x20AC;&#x153;Junkâ&#x20AC;? is intensely interested in the issue of identity, but with a twist: There are no Muslim characters. complex the machinations, the more diďŹ&#x192;cult the storytelling. â&#x20AC;&#x153;Junkâ&#x20AC;? is a ďŹ ctional retelling of an era on Wall Street when junk bonds, or high-risk debt, were used by corporate raiders to take over companies. Some of the players, including Mr. Milken, ended up in jail. â&#x20AC;&#x153;Mr. Akhtar does not expect every audience member to follow every ďŹ nancial twist and turn, but said, â&#x20AC;&#x153;If the human stakes are understandable, if we understand the action of any given scene â&#x20AC;&#x201D; somebody is lying; somebody is trying to steal; there is a vendetta â&#x20AC;&#x201D; those basic human interactions will be understood. That was my gambit.â&#x20AC;? â&#x20AC;&#x153;Although his drama is set a quarter-century ago, â&#x20AC;&#x153;Junkâ&#x20AC;? speaks to the present day. Mr. Akhtar believes that all the sound and fury and political chaos of Trump-era America covers for even greater shifts of money and power to the upper classes â&#x20AC;&#x201D; and that we are looking in the wrong direction and have been for quite some time. â&#x20AC;&#x153;The new landed gentry are those who manufacture money, who have access to massive amounts of capital,â&#x20AC;? he said. â&#x20AC;&#x153;Thatâ&#x20AC;&#x2122;s the strand the play is really following.â&#x20AC;? â&#x20AC;&#x153;The last time we were together, I asked Mr. Akhtar if he ever worried that he should, so to speak, declare a major. â&#x20AC;&#x153;Itâ&#x20AC;&#x2122;s a qualm that drifts in and out of my consciousness, but it doesnâ&#x20AC;&#x2122;t drive what I do,â&#x20AC;? he replied. â&#x20AC;&#x153;Iâ&#x20AC;&#x2122;m guided by invisible inďŹ&#x201A;uences. Iâ&#x20AC;&#x2122;ll hear some odd voice urging me to do this or that, and until I do, I hear that voice.â&#x20AC;? â&#x20AC;&#x153;This latest work is a progression rather than a departure for Mr. Akhtar. He once again mercilessly examines a faith and culture â&#x20AC;&#x201D; in this case, money and Wall Street â&#x20AC;&#x201D; and his characters are subject to the pull of a powerful orthodoxy. An idealistic journalist in the story sets out to â&#x20AC;&#x153;torpedo every piety of this new faux-religion of ďŹ nanceâ&#x20AC;? but edges too close and is compromised and subsumed. The drama is not an overt comment on the current political moment, but it is a kind of parable. It implies we have all been co-opted, having traded our healthy suspicion of people with vast wealth for something more like worship. â&#x20AC;&#x153;The whole culture around rights, itâ&#x20AC;&#x2122;s valuable and itâ&#x20AC;&#x2122;s important but itâ&#x20AC;&#x2122;s not really whatâ&#x20AC;&#x2122;s happening,â&#x20AC;? Mr. Akhtar said. Identity politics on both sides, he believes, has the nation â&#x20AC;&#x153;consumed and distracted from the real story.â&#x20AC;? â&#x20AC;&#x153;Money,â&#x20AC;? he said, â&#x20AC;&#x153;is whatâ&#x20AC;&#x2122;s happening.â&#x20AC;? â&#x20AC;&#x153;His interest in ďŹ nance is longstanding. When Mr. Akhtar set oďŹ&#x20AC; for New York to become a writer, his father, who founded a cardiology practice in Wisconsin, made him promise to read The Wall Street Journal every day. He helped support himself by trading stocks, using as seed money annual stipends of $12,000 or so sent by his parents. WRITTEN BY AYAD AKHTAR DIRECTED BY JACKIE MAXWELL Photo of the cast of Junk by Tony Powell. A version of this article appears in print on Sept. 10, 2017, on Page AR22 of The New York Times with the headline: Following the Money. ÂŠ The New York Times. All rights reserved. Used under License. People watch the flames and smoke rising from Notre Dame Cathedral in Paris as it burns Monday. People pray as the cathedral burns. Most of its artworks and religious relics were saved from the fire. The church’s spire, which was undergoing a 6 million euro ($6.8 million) renovation, collapses in the flames. as a national emergency, rushing to the scene and straight into meetings at the Paris police headquarters nearby. “I tell you solemnly tonight: We will rebuild this cathedral,” he vowed. “The worst has been avoided, although the battle is not yet totally won,” the president said, adding that he would launch a national funding campaign today and call on the world’s “greatest talents” to help rebuild. D oor o i t a P Special! on every window1 Minimum purchase of four. EXTRA 3% Discount When you pay for your whole project with cash, check or credit card1 Minimum purchase of four. Minimum purchase of four. Interest accrues from the purchase date but is waived if paid in full within 12 months. DETAILS OF OFFER: Offer expires 5/11/2019. You must set your appointment by 5/4/2019 and purchase by 5/11/2019. Not valid with other offers or prior purchases. Get $325 off each window and $700 off each patio door and either 12 months zero money down, zero monthly payments, zero interest or 3% off your entire order when you pay in cash, check or with a credit card when you purchase four (4) or more windows or patio doors between 4/1/2019 and 5/11/2019. The 3% discount for paying in cash, check or credit card is taken after the other discounts in this promotion are applied. Financing offer subject to credit approval. Military discount applies to all active duty, veterans and retired military personnel. Military discount equals 3% off your entire purchase and applies after all other discounts, no minimum purchase required. Interest is billed during the promotional period, but all interest is waived if the purchase amount is paid before the expiration of the promotional period. Financing for GreenSky® consumer loan programs is provided by federally insured, federal and state chartered ﬁnancial institutions without regard to age, race, color, religion, national origin, gender or familial status. Savings comparison based on purchase of a single unit at list price. Available only at participating locations. See your local Renewal by Andersen location for details. MHIC #121441. VA License #2705155684. DC License #420215000125. Some Renewal by Andersen locations are independently owned and operated. “Renewal by Andersen” and all other marks where denoted are trademarks of Andersen Corporation. ©2019 Andersen Corporation. All rights reserved. ©2019 Lead Surge LLC. All rights reserved. GET YOUR CHANCE AT OVER $1.2 MILLION IN TOTAL CASH PRIZES! Health officials say New York City has had 285 measles cases since an outbreak began in October. KHARTOUM, SUDAN | Protesters rally outside Sudan’s military headquarters Monday, hours after soldiers attempted to break up a sit-in. Despite that incident, demonstrators praised the “positive steps” taken by the ruling military council, which held talks with opposition leaders over the weekend and released some political prisoners. Last week, Sudan’s military ousted longtime President Omar al-Bashir following months of protests. PLAY THE WASHINGTON NATIONALS™ SCRATCHER! People demonstrate in favor of a new copyright directive at the European Parliament in March. The most debated part of the legislation is a section that makes companies responsible for ensuring that copyrighted material isn’t uploaded without permission from the original creator. It puts the legal onus on platforms to prevent copyright infringement — but critics say it will end up having a chilling effect on freedom of expression on the internet. Some sites would be forced to license music or videos, or make sure they don’t have unauthorized copyrighted material. Critics worry that having to pay for links could create further costs, giving tech giants an edge over smaller companies. Google said last year it spent over $100 million on Content ID, its copyright management system for users on YouTube. Critics say it could act as censorship and change internet culture. YouTube has warned of unintended consequences, saying that in cases where copyright is uncertain, it would have to block videos to avoid liability. Some consumers worry that the new rules would bring an end to parodies and viral memes that have powered online culture. The EU disputes this. The music industry and other groups that collect royalties say the revamp will help give writers, artists and creators more protection of their rights and incomes by requiring tech giants such as Apple, Facebook and Google to pay them more for their work. Some authors and artists fear they won’t earn significantly more money but that their creativity will be stifled. O v e r 8 0 M i l l i o n Fe e t I n s t a l l e d ! Draft quandary: Try to win now or develop a QB? The draft is always about the future, but for Redskins coach Jay Gruden the future is now. Either the Redskins make the playoffs next season or someone else is coaching these draft picks in 2020. At drama-filled Redskins Park, poor choices are usually made when “group decisions” are complicated by individual desires. And there seem to be divisions among front office leaders. Some want to draft a quarterback or trade the 15th overall selection to Arizona for 2018 first-rounder Josh Rosen. Woods led wire-to-wire at the 2002 U.S. Open here and tied for sixth when the tournament returned to Long Island in 2009. Woods obliterated the field here at the 2000 U.S. Open, winning by a major record 15 strokes. He finished tied for fourth here in 2010. Woods has won the Claret Jug three times, but the Northern Ireland course that last hosted the British Open in 1951 will be a bit of an unknown for everyone. *Min. purchase of 50 linear feet required, offer expires 4/30/19. Offer applies to Gutter Helmet only and must be presented at time of estimate, cannot be combined with any other offers and subject to change without notice. Void where prohibited by law. **Subject to credit approval, fixed APR of 9.99% for 120 months. Lednor is neither a broker nor a lender. Financing is provided by 3rd party lenders, under terms & conditions arranged directly between the customer and such lenders, satisfactory completion of finance documents is required. Any finance terms advertised are estimates only. †Based on an independent 2014 national marketing study. DC# 420218000007 MD MHIC #48622 VA#2705036173 © 2019 Lednor Corporation. D.C.’s longest-running restaurant tasting event returns. Journey to the Zoo for a night of animals, entertainment, and the best gourmet bites in the city. Enjoy an exquisite evening while suppor ting the Smithsonian’s work to save endangered animals around the world. Worknesh Degefa, left, and Lawrence Cherono won the Boston Marathon. BOSTON | Daniel Romanchuk of Urbana, Ill., wins the men’s handcycle division Monday in the 123rd Boston Marathon. Romanchuk, 20, became the youngest winner of the event in Boston, finishing with a U.S. record of 1:21:36. He was the first American winner in the event since 1993. Maryland sophomore Bruno Fernando and junior Anthony Cowan Jr. intend to declare for the NBA draft and hire agents, the team announced Monday. Under new rules, college players who sign with an agent can return to school if they remove their names before the draft. Fernando is expected to be a first-round draft pick. Cowan will likely not draw much attention from NBA teams, but he could have other opportunities to play professionally. DO YOU USE HEROIN OR OTHER OPIATES? You may be eligible for a Research Study The National Institutes of Health (NIH) is looking for volunteers who use opiates regularly or who are receiving treatment for opiate use. The purpose is to learn how opiates affect brain function. • Up to four study visits • Medical exam and personal interview • All study procedures and transportation at no cost • Compensation is provided You can participate if you are: • 18-65 years old • Using opiates daily or almost daily • Receiving or not receiving treatment for opiate use You cannot participate if you: • Have a serious medical condition, such as HIV • Have a psychiatric condition, such as schizophrenia that requires medication or hospitalization • Are pregnant or breastfeeding Location: The NIH Clinical Center in Bethesda, MD, is located on the Metro Red line (Medical Center stop). Nationals pitchers smash cabbage in celebration during spring training. Read beyond headlines The next time you see a headline about a study that seems to contradict nutritional norms, scrutinize the story carefully. Check whether it’s an RCT or a correlation study, and whether it’s a single trial or a meta-analysis. Look for possible biases, and see if it was conducted by a reputable institution and appeared in a peer-reviewed journal. C.R. health directory Recent-Onset Back Pain It Interferes with Everyday Life STAR Study is currently seeking volunteers to participate in a clinical research study evaluating a new investigational drug (non-opioid) treatment for patients suffering from recent onset of non-chronic back pain due to or associated with muscle spasms. Concerts, movies, events, restaurants and more. 2730 University Boulevard West, Suite 306 Wheaton, MD 20902 A division of Arthritis and Rheumatism Associates, P.C. If you have a history of gout, you may qualify to participate in a research study. As a study participant, you will receive all study related care at no charge, including physical exams, lab services and study medication. A division of Arthritis and Rheumatism Associates, P.C. APPLY IN PERSON Wednesday, April 24, 2019 10:00 am – 3:00 pm BridgePoint National Harbor 4601 Martin Luther King Jr. Ave. SW Washington, DC 20032 For more information see our website at http://www.bridgepointhealthcare.com/ and search under careers. EOE. Come Join our Team where “Our Employees Make the Difference” NEW Electronic Medical Record New 32 - Bed Ventilator Unit Free Parking…..and more! The Center for Rheumatology and Bone Research is conducting a research trial for an investigational medication for those who suffer from gout. and my family out of his life after a disagreement. He didn’t acknowledge my son’s birth, tell me he got married or acknowledge the gifts we sent when he had a child. My parents think he’s taken it too far but won’t tell him that out of fear of repercussions. Do I just accept that my family is essentially split in two? you — perhaps there was a logistical or communication kink — or yes, it could be that there’s more deliberate poaching going on. Either way, your best bet is to keep initiating social experiences you want to have, and keep nourishing the particular connections that you most enjoy. View it as a question of who best fits you — rather than whether you fit in. At some point, acceptance of this — and letting yourself grieve it — will help you regain control and protect yourself from false hope. For clarity, it could be worth one last reconciliation attempt. Not that you owe him that, but it would be your chance to let him know that you need to move forward. You could say that you still want your families to be in each other’s lives, it saddens you you’re not, and you’re willing to work with him to move forward together. But that this will likely be the last time you reach out for a long while because it hurts too much otherwise. If it’s a final no, you’ll need to accept your parents’ choice as well — and give yourself permission to protect your feelings by focusing on your own family’s relationship with them, even if it means an embargo on the painful topic of his family. Send questions to Dr. Andrea Bonior at baggage@wpost .com. Andrea is a licensed clinical psychologist and hosts a live chat Tuesdays at 1 p.m. at washingtonpost.com. Your questions may be used in the chats. Are you having money and relationship problems? FREE Workshops on Stress Management, Communication, and Financial Management for COUPLES. Workshops are available in Falls Church, College Park, Alexandria, and Bowie. Couples may receive up to $160 for attendance and completion of surveys to evaluate the program. TOGETHER is a project of Virginia Tech and the University of Maryland, College Park. Funding for this Project was provided by the United States Department of Health and Human Services, Administration for Children and Families, Grant: # 90FM0077-04-00. The 36-year-old actor is more withdrawn on “The Handmaid’s Tale” as the feminist icon Offred. , /2 )	3 	 4"
For routes in Crofton & Crownsville, MD Call Conchita Tompkins at 240-432-1914 Excellentpart-time income! Reliabletransportationrequired. Full and part time positions available. Open interviews Monday 12:30-3pm 1704 U Street NW, Washington D.C.
300 Off 1st monthâ&#x20AC;&#x2122;s rent! DC Rider METRO NEWS ON YOUR iPHONE AND ANDROID DOWNLOAD FREE. Apply today and move-in by Friday! SMALL COLLECTOR PAYS CASH FOR COINS/COLLECTIONS. Call Al, 301-807-3266. Will Come to you! For routes in Upper NW & NE areas in D.C.
For routes in Fairfax and Centreville, VA Call 571-252-4788 Excellent part-time income! Reliable transportation required. METRO NEWS ON YOUR iPHONE AND ANDROID DOWNLOAD FREE. PRINCE GEORGEâ&#x20AC;&#x2122;S BEST KEPT SECRET! ONE MONTH FREE RENT*, WAIVED APP FEE. our business. 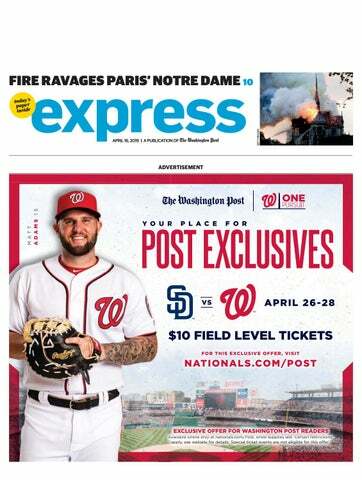 What can The Washington Post Small Business Advertising Team do to drive advertising results for your small business? IN PRINT. Still the best way to kill time during your commute. Consult. Target. Zone. Brand. Create. Grow response. Innovate, and more. Whether your market is consumer or B2B, a small business campaign across multiple print products can reach 51% of super-afﬂuent adults and 41% of small-business owners in the metro market in a 7-day period. What can we do for you? Deliver. Source: Nielsen Scarborough 2017, Release 2; Super-afﬂuent deﬁned as HHI $250,000+.Net 7-day reach of The Washington Post and Express, Washington metro market. “I’m basically Steph Curry without any of the basketball skills.” @BEKDALE, tweeting about The New York Times’ feature on the Golden State guard’s popcorn obsession. The Times detailed how security brings him a bag before, during and after each game. Curry ranked the popcorn from all 29 NBA stadiums on freshness, saltiness, crunchiness, butter and presentation. American Airlines Center, home to the Dallas Mavericks, placed first. “I never knew we needed an Ariana x N*SYNC collab until we got an Ariana x N*SYNC collab.” @HAUNTEDREM, praising the singer after she brought four of the iconic boy band’s five members together Sunday for her set at Coachella. From left, Joey Fatone, JC Chasez, Chris Kirkpatrick and Lance Bass joined Grande on stage to sing “It Makes Me Ill” — which Grande samples on “break up with your girlfriend, i’m bored” — and “Tearin’ Up My Heart.” Diddy, Mase and Nicki Minaj also joined Grande’s headlining set. “Game of Thrones” character’s continued yearning for elephants in the final season’s first episode. Though viewers noted that the animals would be hard to transport across the sea in a wooden boat, many also wondered why Cersei would want elephants when she’s facing two dragons, one undead dragon and an army of White Walkers. find yourself playing a role that is very different from how you conceived it. You have more control than anticipated. FOUR RACK TOTAL Make a 2-7-letter word from the letters in each row. Add points of each word using scoring directions at right. Seven-letter words get a 50-point bonus. Blank tiles used as any letter have no point value. Scrabble is a trademark of Hasbro in the U.S. and Canada. can show off your natural style today, but take care that you don’t neglect something that requires you to get your hands dirty. TODAY: You’ll want a jacket when you head out, but plenty of sunshine allows you to shed a layer by the afternoon. Afternoon highs are pleasantly warm from 65 to 70, with a gentle breeze from the west at 5 to 10 mph. Skies are clear to partly cloudy tonight and there’s little wind. Lows range in the low to mid-40s. SAGITTARIUS (Nov. 22-Dec. 21) You will want to be sure — or as sure as possible — that the approach you are taking today is the right one. CAPRICORN (Dec. 22-Jan. 19) How you seem to others may surprise you today — if, indeed, anyone chooses to share with you. Are you being as realistic as possible? AVG. HIGH: 67 RECORD HIGH: 92 AVG. LOW: 46 RECORD LOW: 29 SUNRISE: 6:28 a.m. SUNSET: 7:46 p.m.
will have to navigate some emotional currents today that threaten to take you far from where you want to go. PISCES (Feb. 19-March 20) What goes on beneath the surface today will have a major impact on what you do, although you may not be aware of it at first. Pay attention. Need more Sudoku? Find another puzzle in the Comics section of The Post every Sunday and in the Style section Monday through Saturday. 1862: During the Civil War, President Abraham Lincoln signs a bill ending slavery in the District of Columbia. Get more news and forecasts at washingtonpost.com/weather or follow @capitalweather on Twitter. Engaging the World from the Nation’s Capital The George Washington School of Business (GWSB) offers a comprehensive array of graduate programs in the heart of D.C., with a strong focus on experiential education, study abroad opportunities, online programs, and lifelong learning. Choose from among ﬁve MBA options, 12 specialized master’s degrees and 24 graduate certiﬁcate programs. Find out more at an upcoming information session! Theater, dance, music and more! If it’s live entertainment you’re looking for, turn to Washington’s go-to source for what’s happening on local stages. Let us know at corrections@wpost.com. @WaPoExpress FACEBOOK: facebook.com/ washingtonpostexpress FLICKR: Join our Flickr pool at flickr.com/groups/ wapoexpress to share your view of the D.C. area, from events to landscapes and everything in between. Your work could appear in Express. Schedule an appointment today. Also, visit us at DCHweb.org.